When it released its 8th-generation Coffee Lake processors, Intel had everyone guessing. But, we weren’t fooled again when it released the 9th-generation Intel Coffee Lake Refresh CPUs. This time around, Intel is bringing higher core counts and faster core speeds across the board – the 9th generation is here. Coffee Lake Refresh sees Intel closing the gap between itself and AMD’s Ryzen 2nd generation processors – we’ll see how successful it is with our full reviews. This is mainly achieved through the Intel Core i9-9900K, the manufacturer’s first 8-core 16-thread CPU for consumers – even if it’s way pricier than the AMD Ryzen 7 2700X, its direct competitor. With these high core counts and clock speeds, Coffee Lake Refresh is a game changing release. Now, these are just the highlights of Intel Coffee Lake Refresh, but we have so much more information to dive into, so strap in for the long ride and we’ll tell you everything you need to know about Intel’s 9th-generation CPUs. 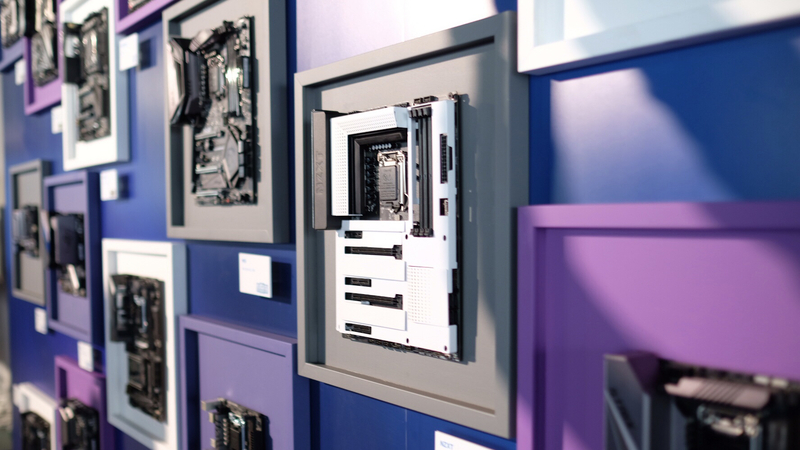 At its 2018 Desktop Launch Event, Intel finally revealed when we can get our hands on its 9th-generation desktop lineup. The good news is that all the speculation was pretty much spot on – preorders are live now, and the chips will start shipping out on October 19. However, we’ve only seen the announcement of there of the Coffee Lake Refresh processors – the Core i9-9900K, Core i7-9700K and Core i5-9600K. We’re sure that the lineup won’t end here, so keep this page bookmarked, as we’ll update it when new processors get announced. We’re sure that Intel is going to pad this lineup with other mid-range and entry-level processors over the next year or so to pad out these massive price gaps. Until then, though, we can still expect fantastic multi-core performance at a reasonable price. Now that Intel has shown us what Coffee Lake Refresh is capable of, we have a clear picture of what these new processors look like. And, while only three Coffee Lake Refresh processors have been revealed, we’re sure there’s more to come in the near future. This initial lineup is noteworthy, as it marks the first Intel Core i7 chip in a while without hyperthreading – instead it just features eight single-threaded cores. Still, that should be plenty, especially considering the impressive 4.9GHz boost clock. 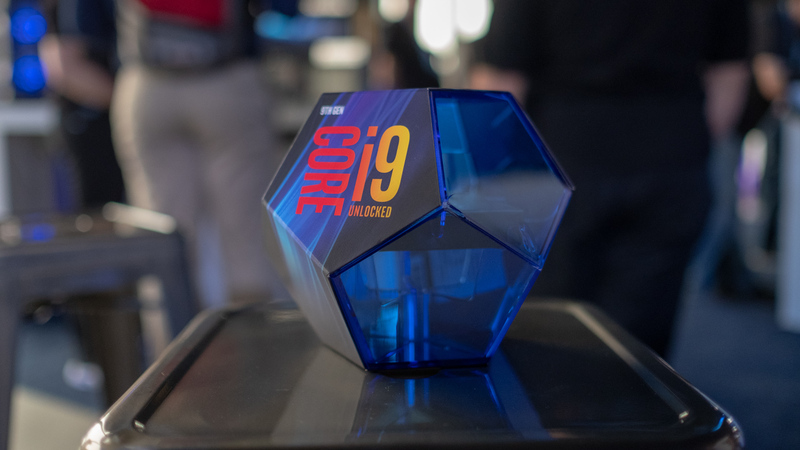 Luckily, there is still a 9th-generation consumer chip that retains hyperthreading in the Intel Core i9-9900K. 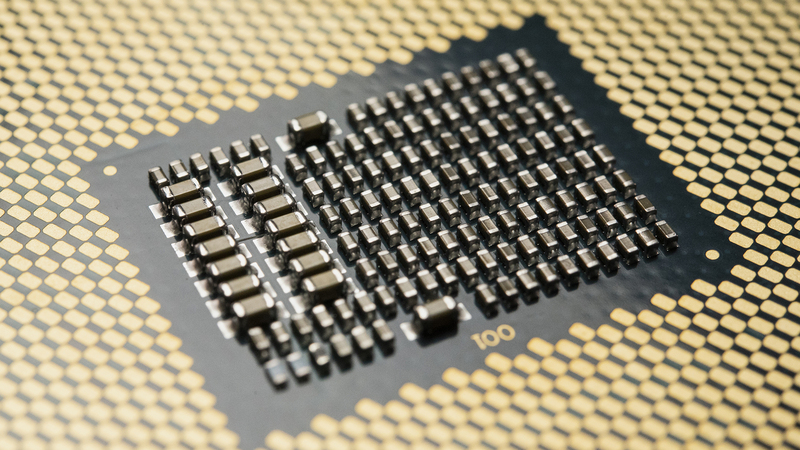 These new processors also feature much improved thermal performance, thanks to soldered thermal interface material (STIM). This should help these processors overclock more efficiently without having to resort to exotic cooling solutions to stretch the performance out. This is big, because Intel has stuck with non-soldered thermal paste to transfer heat between the processor dies and the IHS – much to the chagrin of enthusiasts and overclockers. This new soldered material should be a much more efficient heat transfer medium, which Intel says will lead to easier overclocking. 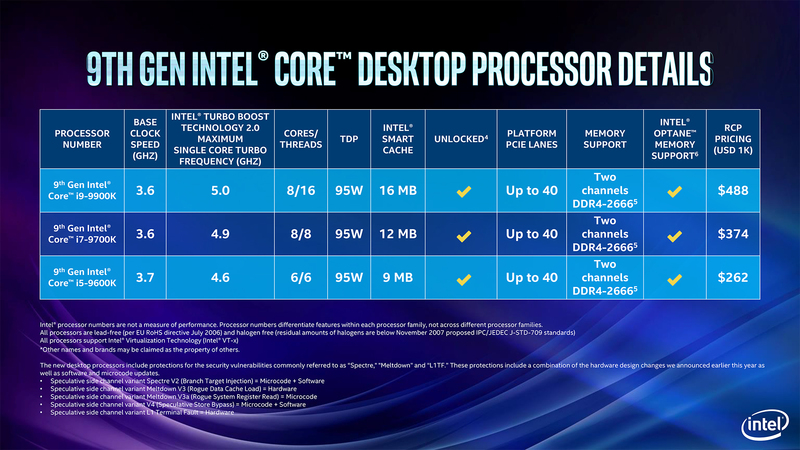 Of course, it wouldn’t be a new Intel processor lineup with a new motherboard and chipset platform. Interestingly enough, Intel’s forthcoming Z390 chipset is on the way, and can finally be preordered, after months and months of speculation. This new platform supports t onboard 802.11ac Wi-Fi, and USB 3.1 Gen 2 – both of which are features not found natively supported on the current Z370 chipset. This new chipset now supports up to 40 lanes of PCIe Express 3.0, but is still limited to dual-channel, 2,666MHz memory. We have finally fully reviewed and tested Intel Core i9-9900K and it is, without a doubt, the fastest consumer processor on the market right now. Intel’s high end chip absolutely dominated everything else in both single core and multi core performance, scoring a ridiculous 33,173 multi-core score in GeekBench 4 – compared to the Ryzen 7 2700X’s 26,011 – it even destroys AMD’s HEDT Threadripper chips in many everyday situations. However, be careful of the inflated price you’re paying for this higher performance. WE haven’t tested either the Intel Core i7-9700K or the i5-9600K yet, but those reviews are on the way. Until then, though, we have some preliminary results from Intel, but take these with a grain of salt. Back at Intel’s reveal event for Coffee Lake Refresh, we were able to test the new processors in gaming specific workloads, where the Intel Core i7-9700K was able to hit 30,339 points in a World of Tanks benchmark – compared to the Intel Core i9-9900K’s 33,108 in the same test at the same event. Meanwhile, the Intel Core i7-9700K was able to hit 30,339 points in that same World of Tanks benchmark – which is impressive given that chip doesn’t feature multithreading. We’ve also seen a hint of what the Intel Core i5-9600K will be capable of. Some leaked benchmarks not only show insane performance out of the mid-range chip, but it will also apparently be capable of a 5.2GHz overclock across all cores, while on air. That’s a crazy number, and certainly a good sign, but we’ll have to wait to see if it holds any water. Unfortunately, those are the only benchmarks we really had access to. We’ll perform our full suite of benchmarks when we get our hands on the chips for a full review, and we’ll see how they stack up against AMD’s Ryzen 2nd Generation offerings like the Ryzen 7 2700X. That’s all we know for now. There is surely still a ton of news to come. Per our usual advice, we encourage you return to this page periodically for in-depth coverage of the latest Intel Coffee Lake Refresh news, information and reviews.